The spear is the mark of a man. As the distaff, for holding spun flax, was the mark of the female then the staff with an iron point was the mark of the male. Spears were carried by men in daily life in Germanic society and were still taken to assemblies in viking times. In the pagan period a spear was buried with a male more commonly than any other item apart from a personal knife. 'Spear god' from Tanum, Bohuslan. Maybe an early Iron-Age image of Odin or his precursor. The earliest known hunting tools are spears. Eight examples were found at Schöningen near Braunschweig. Made of spruce and one of pine, the shafts were carefully made and sharpened. Probably used without a head they were sharpened and maybe fire-hardened. Now kinked due to differential loadin gduring their time in the ground, the shafts were iriginally straight and balanced well to be thrown. They are 1.82 to 2.5m long. These spears are 300,000 years old ! It is assumed the spears were used to hunt animals in shallow lake waters. These 'hunting' tools could easily have been used in case of conflict. Spears are the archetypal weapon of war because of their reach and their deadliness. A spear can reach out and kill a man who thinks he stands safely distant from his enemy. 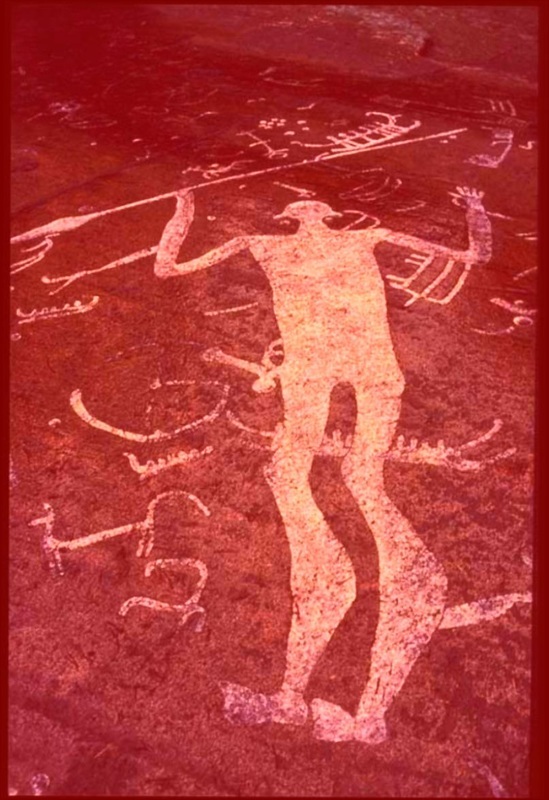 A spear kills with a small hole piercing deep into the body. Swords were aristocratic weapons which were also for a display of wealth and status. Swords could deliver terrible wounds but also wounds one could survive with the right care. Amputation and long cuts could be treated and healed but a stab penetrating organs, the head or the intestine were deadly, even if the wound was disproportionately small in appearance. The spear is a thief of life, a stealthy raider which snatches a man away and a deceptively simple thing rendered eleagant and cruel by a well-made spearhead on the simpe wooden shaft. Odin uses a spear because he is the deceiver, the untrustworthy and the god of the chaos and randomness of battle. No one is safe when spears are in action. The low can kill the high, mail can be pierced, shields holed and the breath of a man plundered. The spear is used for the hunt and as a weapon of war. Lighter spears were for throwing and heavier spears with a larger head for stabbing the prey or enemy at close-quarters. Throwing spears were used with a throwing-strap or spear-thrower to increase range and power. Spears for fighting were usually versatile and could be held or thrown though there are types specifically for throwing or use in the hand. Warriors with full equipment were 'triple-armed'. First they had a side-arm which was usually a sword for any decently-equipped warrior. 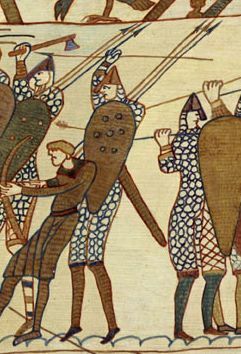 Second, they had a spear with a larger head and stout shaft for fighting in a phalanx. Third, they had two or three throwing spears for use in the early stages of a fight or in a stand-off. An axe could stand-in for one weapon option. Grave goods vary from this pattern but in bog finds where the equipment of individuals can be identified , this pattern is conformed. What we know of the Roman army also confirms this equipment. We can see this equipment as the normal equipment of heathen warriors in north-western europe from the centuries BC through to the christianisation and feudalisation of each tribe or state in succession down to the final conversion of the whole region in the fourteenth century. Two throwing spears, fighting spear and sword. Also two knives. Grave goods from Luistari, Finland, 1st half 10th century , including javelin, spear, sword and knife. Smaller spearheads - often difficult to distinguish from arrow-heads, are actually dart/javelin heads and intended for throwing, rather than thrusting in the hand. 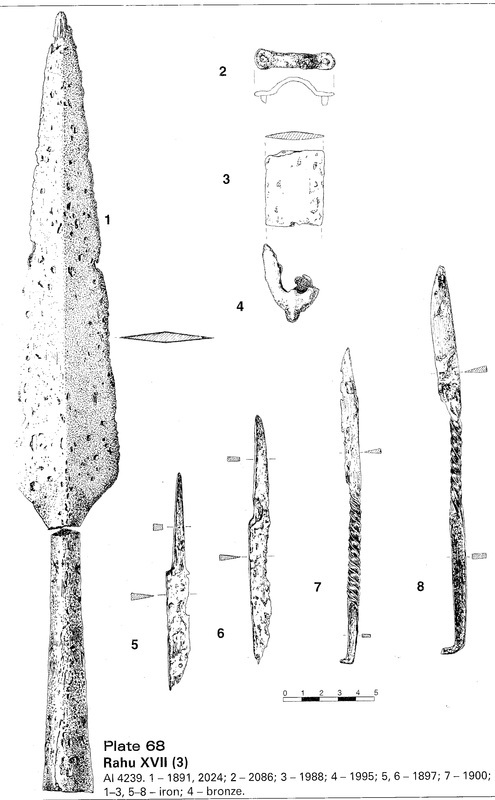 Often old or damaged spearheads are cut down to be javelin heads.